Ernesto Sánchez Valdés is a young documentary filmmaker who has recently gained critical acclaim for Héroe de culto (Cult hero), a 27-minute film which explores – without voiceovers, narration, or interviews – the saturation of contemporary Cuba with the image of José Marti. 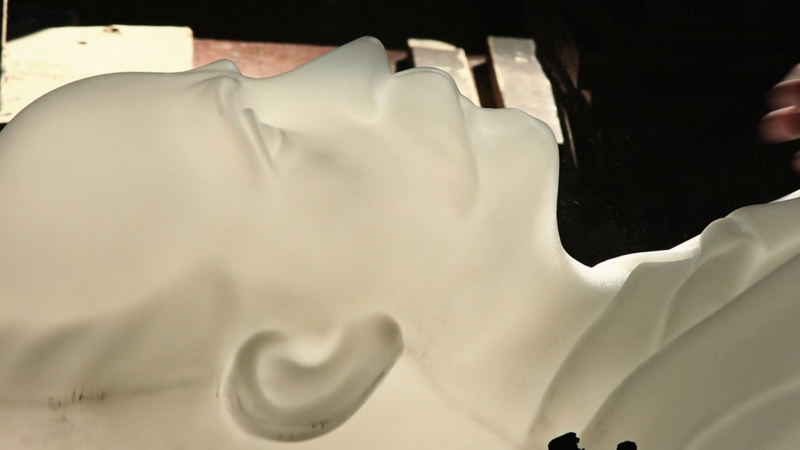 By juxtaposing footage of the mass production of plastic busts of the national ‘Apostle’ with a historical account – compiled through the use of newspaper clippings and sequences from José Massip’s Páginas del diario de Martí (Pages from the diary of José Martí, 1971), the film draws attention to the beginnings of the cult to this national hero, and encourages us to reconsider the significance and deployment of his sanctified image, which overexposure has rendered almost invisible. The documentary has attracted considerable attention from within Cuba not only for its critical reflection on the uses and misuses of the iconic figure of Martí but also for its understated approach and sophisticated visual language. It has won multiple accolades including best documentary at the 15th Muestra de cine joven (2015). It was also selected for the official programme of the 12th international Festival de cine pobre “Humberto Solás” in Gibara. In the interview below, Ernesto Sánchez Valdés talks to Dunja Fehimović for Cuba Counterpoints about Héroe de culto, his career so far, and the future of Cuban cinema. As a young filmmaker who has grown up with the heritage of ICAIC on both personal and professional levels, but who is also passionate about the legalisation of independent production, Sánchez Valdés gives us an insight into the balancing acts inherent to the complex sphere of filmmaking in contemporary Cuba. Sánchez Valdés is adamant that his current base in Sweden does not and should not exclude him from the collective of Cuban filmmakers. Balancing his current geographical distance with deep concern for the future of Cuban cinema, the director represents a growing number of young professionals and creators who are increasingly mobile but steadfastly committed to the island and its culture. DF: How did you begin your career in film? ESV: I started my career in the world of cinema as an assistant director and that’s something I’m very proud of, not only because of the value and importance of that work but also because I started understanding cinema from positions that were far from privileged – as we say in Cuba, “from below.” And along those same lines, I must also say that the experience of living with a filmmaker (my father Jorge Luis Sánchez) made cinema an everyday experience for me. As a child, I found filming extremely boring because of the many takes, and after all these years I’ve ended up being one of those boring people who film take after take in search of perfection. To this day, I’m still passionate about that search for perfection and my definitive encounter with cinema was characterised by the love of watching films and understanding them, and that’s the origin of everything I’ve been able to do so far. DF: How did Héroe de culto come about? ESV: I needed a topic to make a documentary in order to graduate from FAMCA [Faculty of Audiovisual Arts and Media at ISA, the Art University of Havana] and Héroe de culto came about because of the coincidence of seeing sparrows playing inside a bust of José Martí that had no nose and was hollow. The bust was made of plastic and that was the trigger that got me thinking that if there were mass-produced plastic busts, there might be a machine and a production line of considerable size. I had found the topic and ahead of me lay a long process of developing my ideas and organising the production of what is now Héroe de culto. The next step was finding where the busts were made, getting the necessary permits and trying to find support and funds to be able to work with a decent economic level. Our first efforts in this sense were fruitless, so we decided to start work with our own resources. My crew, made up of four friends, followed me in this endeavour without hesitation, despite the difficult conditions in which we started filming: Abel Pino (cinematography), Raymel Casamayor (sound), Carolina Arteaga (assistant direction) and Marcia Louit (production). So we started filming one of the factories and when we finished there we were in a position to make a ‘teaser,’ which we used to try and secure funding and support again, because even the support of FAMCA and ICAIC [the national film institute] was not enough to continue with the documentary. The prizes awarded by EICTV [the International School of Film and Television at San Antonio de los Baños] and ICAIC at the Haciendo Cine event as part of the 14th Muestra de Cine Joven [an annual showcase of young filmmakers’ work] in April 2015 were crucial in this sense. The following month, we received a grant from Sparring Partners. With these generous inputs, we were able to finish the documentary which had started out with a lot of drive but few resources. What do ICAIC and the Muestra Joven mean for you as a young filmmaker? ESV: The Muestra is important because it’s the alternative arena where the young people who will make the Cuban cinema of the future have their space. It’s the space where we young people think about the cinema of the future and where the other side of Cuban cinema is exhibited. A vital space that I consider my home. On the other hand, in ICAIC I’ve learned everything I know. Being on the set of a feature film over the course of two to three months is an experience that anyone who aspires to be a filmmaker should have. And I had that opportunity in so many ICAIC features I worked on, surrounded by both founders – people who drove Cuban cinema forward in the 1960s, and also other generations that have made cinema in Cuba. That’s where I met excellent professionals who, despite their different origins, come together in a language that unites us all. It’s very hard for me to sum up what ICAIC and its people represent for me. Perhaps I could say that it’s like my other home, although today it is not as well maintained as it ought to be. I feel part of the cinema made by ICAIC. My career has been very similar to the majority of directors at ICAIC, since it has followed certain steps – from assistant director to first assistant director, and finally to director of documentary films. The careers of almost all our most prestigious directors began in this way, since there were no film schools and so the ‘school’ was practice. At the same time, I’m also an admirer of good Cuban cinema, from Memorias del subdesarrollo [Memories of Underdevelopment, Tomás Guitérrez Alea, 1968], De cierta manera (One Way or Another, Sara Gómez, 1974], and Lucía [Humberto Solás, 1968], to Hanoi martes 13 [Hanoi, Tuesday 13th, Santiago Álvarez, 1967], Un pedazo de mí [A Piece of Me, Jorge Luis Sánchez, 1989], and Madagascar [Fernando Pérez, 1994]. There’s a long list of films that make me feel proud of my country’s cinema. I’m passionate about the possibilities of editing and montage in cinema, and in my short career as a director I’ve tried (with my editors) to ensure that my documentaries have an attractive montage. Some close friends who think highly of me have told me that, at times, my work resembles that of Nicolasito [Guillén Landrián], Santiago Álvarez, and the documentary cinema of the 1960s. Although I don’t quite believe them, I would be happy if that were the case. In terms of my approach, I would like the films that I make – that I manage to make, to show a worthy image of my country and its reality, to demonstrate a dignity that would come from seriousness, sincerity and responsibility, with truth and without frivolity, and of course always thinking about film as a medium. I think that in that way I would be a deserving inheritor of my cinematographic predecessors. DF: How was ‘Héroe de culto’ received? ESV: Héroe de culto is a documentary that I have not had many opportunities to watch with the public. I saw it in Italy at the Terra di Tutti festival, and then in Cuba at the Almacén de la Imagen. I would have liked to have seen it at the Muestra de Cine Joven but I was out of the country at the time. My colleagues and crew tell me that it was a very good screening, in the Chaplin cinema, which is the dream venue for us, and that makes me happy. That feeling of being in a darkened room and hearing the reactions of the public is really what gives your ideas meaning, because they escape your immediate circle and become public. It gives you goosebumps. Now, I have received many nice comments about the film – many more than I expected, since at one stage I thought my ideas might be misinterpreted. But that is not the case as far as I have heard; rather many people have welcomed the topic, and the way we’ve addressed it, as well as the specialised work of the different crew members. We even won awards at the 15th Muestra de Cine Joven. There have been interviews and articles, and the majority are constructive, respectful, and that’s really great for Héroe de culto. I think that all of this will do more than flatter those of us who made the documentary – it will start to change the thinking around the meaning and significance of the bust of José Martí, its placement, its effectiveness, and its reason for being. And after that, it might provoke people to think about the real Martí, not only the plastic, static, object that overpopulates our streets. DF: What does Martí mean for you? What is his relevance for contemporary Cuba? 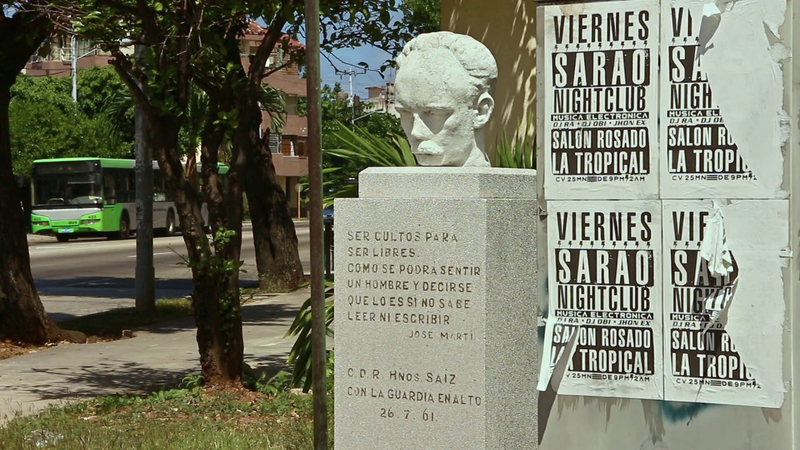 ESV: One of the ideas expressed by this documentary is that the mass production of the bust does not necessarily favour its social function: the persistence of José Martí in the memory of the Cuban people. And although it’s arguable, I would stand by that idea. In 1966, Tomás Gutiérrez Alea established the pattern with the first sequence of his La muerte de un burócrata (The Death of a Bureaucrat), where a surreal machine produces the bust of José Martí. The hero was manufactured like an object and the machine was a reflection of that particular, concrete way of trying to perpetuate an idea. It’s because of this and because of my admiration of Alea’s cinema in general that I dedicated the documentary to him. I think that Martí has been pigeonholed, and he has been cast in many artistic manifestations and tributes as a sacred, perfect being. And perfection is very difficult to represent, especially when it’s a human being. Whenever I see attempts to represent him in action, I have the impression that he is being filmed in slow motion. Often when we see models of the past and its manners, we think that they were much slower times than our own – like that false idea we have that old newspapers were printed on yellowed paper. This happens even more with Martí because of his importance in the history of Cuba. Cuban cinema has not escaped this trap in its representation of Martí; although I understand the weight of responsibility of embodying or giving voice to Martí, that doesn’t mean that you need to construct an erroneous image of a man who might have been very simple in his movements, his way of walking. Although Héroe de culto is a documentary about José Martí, it focuses more on the bust and its meaning, although it points back inevitably to its referent. I know that it’s a huge challenge and risk to make a Martí for the cinema and for that reason I think that Páginas del diario de José Martí (Pages from the Diary of José Martí, José Massip, 1971) and José Martí: el ojo del canario (José Martí: the eye of the canary, Fernando Pérez, 2010) are very accomplished films in themselves and also because of the vivid way in which they depict José Martí. At FAMCA, they suggested to me that I read Martí’s reviews for an art appreciation class, and I was left stunned by his foresight. There was also an essay by Carpentier entitled “Martí y Francia,” in which I was shocked to see how Martí had valued artists of his time, and how subsequently, History had revealed those creators to be just as Martí described them. These encounters with Martí helped me to overcome the schematic vision of “Los zapaticos de rosa” [‘The Little Pink Shoes’] and the “Versos sencillos” [‘Simple verses’] and to realise that the behind that condensed dose of Martí we were all administered, there is a different José Martí, a poetic, diverse, critical, very socially and politically aware, sensitive to the point of tears, human Martí. So today I have a different vision of Martí, but it’s full of ignorance given the expanse of Martí’s work, so I can’t consider it to be a generalised perspective. The sad thing is that as time goes on, these men – not gods, from our own 19th century, will end up on peso notes, in epithets, in the few photos that they have and their true essences will exist in books that won’t be read by everyone, because not everyone can or should read it all. DF: What do you think that the role and significance of documentary film are in our times? ESV: I think that works of art have the virtue of communicating and expressing the current reality in a lasting way, and the documentary remains – in the audiovisual realm – that direct window onto the bitter realities that coexist in our day to day lives. It remains much more immediate than fiction, it’s much less dependent on the mainstream (a characteristic that both saves and condemns it at the same time), or rather it has a much smaller mainstream, and I feel that its narrative codes are much more easily reinvented. In my humble opinion, it has more possibilities for expression. But the most important thing is that documentaries can hold up a mirror to the truth using its own protagonists and its own reality. Not long ago I saw a Brazilian documentary called Ônibus 174 [Bus 174, José Padilha, 2002], and with a lump in my throat I can confirm that the visions offered by the documentary form – whether raw, elaborate, or poetic – all of them, are an important means to communicate certain realities to the world. If documentaries were important in the past because there was no internet or distribution channels with the same reach as we have today, and for what they showed and how they did it, I feel that today they remain important given the excess of information, the abundance as well as the alienation that the internet offers or causes. DF: How do you see the future of Cuban cinema, particularly given the recent changes in the relationship with the US? ESV: For me, the reestablishment of links with the USA is a necessary step. I don’t think that the mutual distrust can disappear in the next five years, but rather it will be a long process of normalisation that will require the healing properties of time. Both on their side and on ours. Personally I don’t expect anything from the US government. Their aim with Cuba is to expand their economic possibilities (at a minimum) and to exploit (at a minimum) our natural, industrial, professional, and cultural potential. It will depend on Cuba whether this is done in a fair way, where our potential is properly valued, since the USA have no interest in that. At the moment they’re probably scouting out which Cuban realities might be of interest to the US public in order to develop series (I’ve already heard of something so strange as a series about groups of Cuban santeros at war with each other, typical of the US style of cultural appropriation), films and other products where it won’t just be a few days of filming as it was on Fast and Furious 8 [directed by F. Gary Gray, forthcoming in 2017]. Rather, the idea will be to ‘refresh the vision’ with new locations, characters, and conflicts that will help them continue their business and where the star location will be Havana rather than New York or LA. I wouldn’t be surprised if they produced a film about Tony Montana’s (Scarface) childhood in Cerro in the 1960s to 70s. Cuban cinema will continue to fight to be made. Nobody is going to wait and see what the “Americans” will bring again, but rather we will fight for a film law. That’s the goal. And if Hollywood wants to film in Cuba, then let them pay as they should both for the locations and also for the services of Cuban professionals. DF: What do you think of the project advocating for the creation of a ‘film law’ in Cuba? ESV: Everything about the film law comes from a need to have a framework and strength beyond passion and talent, through which the filmmaker, our work, and our knowledge can be protected. In Cuba we are in a kind of limbo in terms of the audiovisual field, which disrupts the development of production (which is what makes film possible). The times that are coming now show that it’s not enough for many Cuban filmmakers to be alert and aware of the tornado that’s about to hit, but rather we need all of that effort to be embodied in a law that defends the Cuban professional, our know how, and that rewards our work based on that principle, and not on the idea that our reality is somehow cheaper. It would be a law in which the creation of a film development fund would be crucial, so that the financing dynamics could be more logical and support the most valid, clearest project. It would be a law that would value creation and expression above all, that would protect Cuban filmmakers so that our existence can be legally recognised and we can solicit permits, hire professionals, etc. Above all, it would be a law according which film is the most important thing – the creation of films would be the goal, and it would provide the means by which we can all create films. DF: What are your plans for the future? ESV: I have many more projects to make than I have managed to finish. So I have many ideas that I would like to develop but for the time being I can say that I will continue to make documentaries, since that is where I feel I can best express myself. I want to keep exploring the documentary as a form, since Héroe de culto opened many possibilities for us in terms of cinematic language. Dunja Fehimović is a Lecturer in Spanish at Newcastle University, where she teaches on film, literature, and culture in Latin America and the Caribbean. 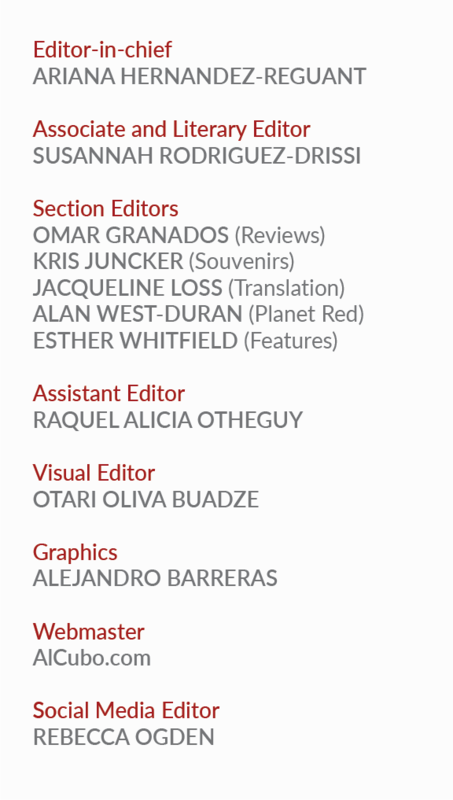 She has contributed to the news portal Pulsamérica and online literary translation project Palabras errantes. She also has published in journals such as the Bulletin of Latin American Research (BLAR) and the Journal of Latin American Cultural Studies (JLACS). You can follow her on Twitter at @Dunja_Fehimovic .